So, annoyed that your good-as-new iPhone already looks obsolete next to the just-announced iPhone 5 and its jumbo-sized touchscreen? Well, good news: your old iPhone is about to get a fresh coat of paint. Besides the iPhone 5 and its snazzy four-inch display, Apple has another trick up its sleeves: a brand-new version of “iOS,” the software that powers the iPhone, iPad and iPod Touch. Slated to arrive on September 19, iOS version 6 (or “iOS 6” for short) packs in a slew of must-have features, including a revamped Maps application, easier Photo Stream and Facebook sharing, on-the-go FaceTime calling, and a long-overdue “do not disturb” mode. Best of all, you don’t need an iPhone 5 (which is set to go on sale September 21, by the way) to take advantage of the goodies in iOS 6. Apple has rebuilt the iPhone’s Maps app from the ground up, adding nifty new features like eye-popping 3D “flyovers” of major metropolitan areas, smoother map scrolling, and real-time traffic alerts. In addition to turn-by-turn car navigation, the new Maps app in iOS 6 also features real-time traffic alerts. Best of all, through, the native Maps app is finally getting true, turn-by-turn navigation complete with spoken directions, just like on the latest Android phones. The catch? 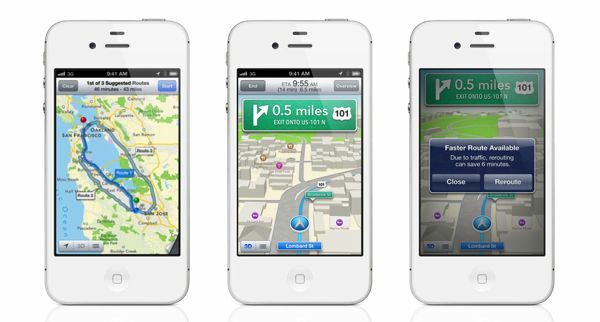 Turn-by-turn directions and 3D “flyovers” will only work on last year’s iPhone 4S and the new iPhone, not the iPhone 4, 3GS or any other prior iPhone models. Update: Hate the new iOS 6 Maps app? You’re not the only one, and even Apple has apologized for its patchy, glitchy map data. 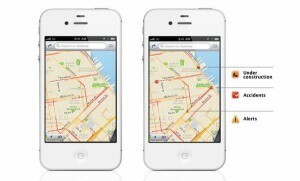 Luckily, there is a way to get Google Maps back on your iPhone. 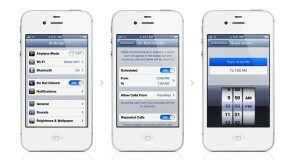 Want web pages on your iPhone to fill the entire display? With iOS 6 on board, you’ll be able to tap a new “full screen” icon when you’re holding your iPhone in a “landscape” orientation. Nice. Want a little peace and quiet? A new “do not disturb” mode will shush all those insistent beeps, ring tones, banners and other alerts from the iPhone’s Notification Center, perfect for keeping your iPhone quiet at the movies or while you’re trying to get some shut-eye. Just activate the iPhone’s new “do not disturb” mode to take a break from beeps, buzzes, and other alerts. You’ll also be able to set the “do not disturb” mode to turn itself off and on automatically at certain times of the day, as well as designate specific contacts who will always be able to get through, no matter what. Want to show off the latest snapshots in your iPhone’s Photo Stream? The latest version of iOS makes it much easier to share Photo Stream pictures with fellow iPhone and iPad users: just tap the photos you want to share and choose some names in your contact book. You’ll also be able to share Photo Stream photos over the web, or comment on the Photo Stream images that your pals have shared with you. Annoyed that you can’t post your latest snapshots to Facebook without opening the Facebook app or composing an email? Well, thanks to iOS 6, you’ll be able to post photos directly from the iPhone’s camera application or your photo albums. You’ll also be able to sync the profile photos and personal info of your Facebook pals with the iPhone’s contact book, as well as add Facebook birthdays and other events to the calendar. With iOS 6 on your iPhone, you’ll be able to send a text message at the same time you’re declining a call. Android phone users have long had the ability to decline a call and send a text message to the caller at the same time—and now iPhone users will have the same nifty feature, plus the option of getting a reminder after turning down a call. Until now, FaceTime video chat on the iPhone and iPad has been restricted to Wi-Fi only. Starting with the release of the new iOS software, however, you’ll be able to make FaceTime calls over cellular 3G and 4G data networks on the new iPhone, the iPhone 4S, and the new iPad. 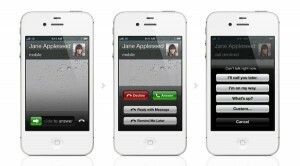 Unfortunately, owners of the iPhone 4 or earlier iPhones will still be stuck with Wi-Fi when it comes to FaceTime. Also, don’t forget that mobile data isn’t free, and that some carriers (such as AT&T) may demand you switch to a new plan before making mobile FaceTime calls.